This was a sad day for me to hear that one the people that helped me through my Judo career has passed on, Bill was a hard task master but someone that gave everything he had to his sports and martial arts. I originally knew him only as a Judo player when he was helping to organize the BJC British Judo Team. We found that we also had other things in common when I said to him one day that I wanted too compete in a Aikido Event that was being run during the interval of a European based Judo Competition. Much to my surprise he said yes although I still had the final’s of the Under 63Kg to fight later that day. I am please to say I managed to win both. He then arranged for me to receive my Dan Grade in Aikido through Peter Schonvel of the IBF who was running the Aikido Event at the time I think I was either 2nd or a 1st Kyu with the ADS under Don Bishop. I never wore that grade although I was very grateful to Bill. My last meeting with Bill was at the Abbe Event on the 14th May 2005, Where I was pleased to have a few minutes chatting to him about old time’s He made a supreme effort to shake my hand. It made my day!!!! My best wish go to his family and friends, If other people have as good a memory of Bill as I do, Then his life was well spent. 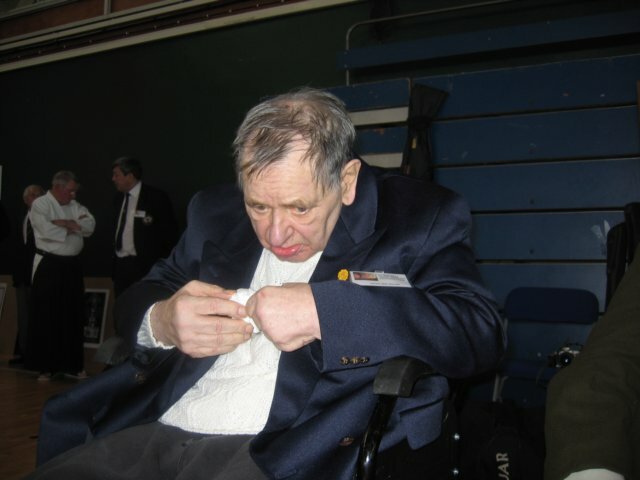 With the sad passing of William Woods Sensei 8th Dan Judo, on the 31st March 2006. British Martial Arts has lost one of its most celebrated figures in the history of British Budo. Woods Sensei was the London Judo Society LJS Judo Champion when the legendary Budo master Kenshiro Abbe first arrived in Britain in 1955. Abbe Sensie would soon select Woods Sensei as a special student. This was the beginning of a long and successful relationship. Abbe Sensei became disillusioned with the LJS and left to join with Matsutaro Otani Sensei taking Bill Woods Sensie with him. Bill later became secretary and personal aide to Abbe Sensei. Bill Woods Sensei helped to create the British Judo Council BJC, British Kendo Council BKC, British Karate Council BKC, British Aikido Council BAC. The various organisations grew to a membership internationally of over 35,000 members. Bill was the first person to be graded to 1st dan Kendo by Abbe Sensei receiving certificate No 1 with Tomio Otani receiving certificate No 2. I have known Bill for 50 years and believe that Bill was the most influential figure ever in British Martial Arts other than the master himself. On the 14th May 2006 the Kenshiro Abbe Sensei 50th Celebration was held at the Crystal Palace Arena London UK. I am so pleased that Bill despite his ill health made a supreme effort to attend the event to pay his respects to his teacher Abbe Sensei. Sensei William Woods will be sadly missed by all that have been influenced by this incredible man in his 55 years of Martial Arts. I would like to offer my condolences for all those that knew and respected Bill Woods Sensei, to his family, friends and students.